Cinemark theaters’ Classic Series has become an easy way for people to see older films on the big screen. I recently watched 1987’s The Princess Bride. Rob Reiner’s glorious comedy adventure is a delightful tribute to vintage fairy tales of old. Almost 30 years later and the picture has lost none of its luster. The production captures lightning in a bottle with each actor arguably giving the most memorable performance of their film careers. Mandy Patinkin deserves a lot of credit for his noble Spaniard out to avenge the death of his father. His famous oath: “Hello. My name is Inigo Montoya. You killed my father. Prepare to die.” is the stuff of movie legend. Wallace Shawn is particularly funny as a delusional criminal genius. Joining the two is André the Giant perfectly cast as, what else, their giant friend Fezzik. The three of them form a wandering outlaw trio with camaraderie to spare. Cary Elwes and Robin Wright perfectly embody the quintessential romantic duo. Billy Crystal and Carol Kane are amusing as a forest dwelling troll doctor and his wife. “Have fun stormin’ da castle.” Even Peter Falk as Grandpa who narrates and Fred Savage as his grandson provide a wonderful framing device through which the story is told. In this way, developments are halted at opportune times where jokes can be inserted for comic effect. This entry was posted on January 15, 2014 at 8:00 pm and is filed under Adventure, Comedy, Family, Romance with tags 1987. You can follow any responses to this entry through the RSS 2.0 feed. You can leave a response, or trackback from your own site. Great review. I love this movie. Shame Rob Reiner will never make a movie this good again. At first I thought, hey wait a minute, let’s not write him off just yet. Then I looked at his filmography. The last “hit” he directed was 2007’s The Bucket List which I hated. The last movie I actually enjoyed from him was The American President and that was almost 2 decades ago. I think this is the first 5 star rating I’ve seen from you; is this your favorite movie? What is your top 5 favorites of all-time?? I give at least one 5-star review every year. The Princess Bride is truly a fairy tale classic. I agree with your review whole heartily with one exception. Mandy Patinkin’s final revenge scene as Indigo Montoya was too blood thirsty for the rest of the mood of the tale. I guess 20 years of waiting made him a bit aggressive. Great review. And completely agreed. I just rewatched this myself, actually, and was every bit as amused as I ever was. I don’t know if they have a Cinemark theater chain where you live, but I think you’d enjoy seeing these films on a big screen again. What about AMC Theaters or Regal Cinemas? They both are showing the same classic series as well. I have an AMC. And I have noticed some classics playing, but I missed The Princess Bride. 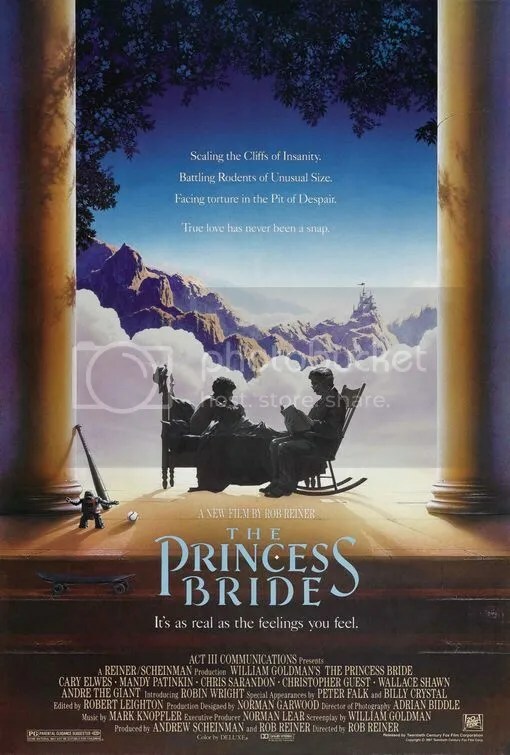 THE PRINCESS BRIDE put two unknowns on the Hollywood map…Cary Elwes and Robin Wright not to mention Fred Savage who would go on to bigger and better things in their professional careers….including Robin Wright who would go on to win the Best Actress Oscar later on. It’s hard to believe, but The Princess Bride didn’t even make the Top 40 highest grossing films in the year it came out. Robin Wright has never even been nominated for an Oscar. The Princess Bride made stars out of two unknowns who went on to become big time actors in their own right….Cary Elwes and Robin Wright. I always expected Cary Elwes would become more of an action star in the mold of Errol Flynn. After this, I think Robin Hood: Men in Tights and Saw are what remember him from most. They do showings of classic movies during their weekday schedule that show films from the 1930’s and beyond,but they do this once a week with special admission. I forgot to mention Chris Sarandon	as Prince Humperdinck and Christopher Guest as Count Tyrone Rugen. They were fantastic too. this is a film that i have to revisit. but just to further support him, he is also memorable in The Crush, Days of Thunder, and most especially Hot Shots. It definitely deserves a re-watch. I wish they showed The Princess Bride around here on the big screen more often. I totally would go see it. You’re totally right, many of these actors give the finest performances of their career in this film. There’s also great set pieces and memorable goofy lines that are endlessly quotable. Case in point: “Inconceivable!” I loved it a couple of years ago when someone came out with the Inigo Montoya meme “I don’t think it memes what you think it memes.” That one cracked me up.